Well, it’s September already and another baseball season is winding down. Seems like a good time for Roadtrip-'62 ™ to review what happened in the 1962 Major League Baseball season. Baseball season was one of my favorite parts of the year in 1962. It helped that it coincided with having the summer off from school. Of course I collected baseball cards, listened to the Detroit Tigers on the radio, and played baseball at the school playground. I also collected baseball cards, mostly Topps that came with bubble gum, and the cards from Post. 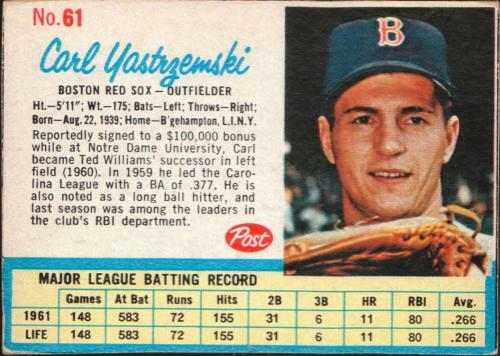 The Post cards were printed on the backs of various Post Cereals and on Jello, and I ate a lot of both in 1962. Chewing a slab of pink bubble gum from a package of baseball cards, together with reading some comics, made for a summer afternoon that couldn’t be beat. 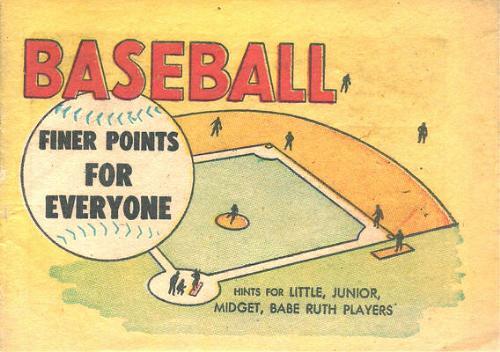 But one comic I never ran across when I was young was “Finer Points of Baseball for Everyone”. It was a small giveaway promotional comic distributed by Hood Ice Cream, Bunny Bread, International Harvester, and other companies. The comic was published by William C. Popper & Company in several editions from 1960 to 1965. Popper also published a number of other baseball rules comics from 1960 to 1975. This would have been good to have when arguing some rules! Baseball was much simpler back then, with only 10 teams in each of the American League and the National League for 1962. This was two more teams than existed the previous year, as both the New York Mets and the Houston Colt .45s (later renamed the Astros) were added to the National League as what was known as “expansion” teams. This was the second phase of the expansion, as two teams, the Los Angeles Angels and the Washington Senators, were added to the American League in 1961. No divisions existed and a playoff only occurred because of a tie in the National League, when both the San Francisco Giants and the Los Angeles Dodgers finished the season with identical win–loss records of 101–61. The Giants won the series in three games and went on to the World Series. 1916 Philadelphia Athletics of the American League, with 36 wins and 117 losses for .235 percent. 1935 Boston Braves of the National League, with 38 wins and 115 losses for .248 percent. 1962 New York Mets of the National League, with 40 wins and 120 losses for .250 percent. The closest anyone has come to that in recent years is the 2013 Houston Astros of the American League, with 51 wins and 111 losses, for a winning percentage of .315, which is still worlds better than the Mets! If you’re interested in watching baseball played in a stadium that you could have visited in 1962, you don’t have many choices as there are only three remaining. The overwhelming majority of the current stadiums have been built since 1990. Fenway Park in Boston, home of the Boston Red Sox, is the oldest major league stadium still in use, having opened in 1912. It was rebuilt in 1934 and has since had some improvements and seating changes. Besides the Red Sox, the old Boston Braves played at Fenway for the 1914 and part of the 1915 season. And yes, the current Atlanta Braves trace their lineage back to Boston. It is most famous for the Green Monster, a wall in left field. Fenway Park is the fourth-smallest Major League ballpark by seating capacity, and one of only eight stadiums smaller than 40,000 spectators. Another stadium from that era, Wrigley Field in Chicago, opened in 1914 and is also still in use. Wrigley is the home of the Chicago Cubs, but originally opened as Weeghman Park for the Chicago Whales of the Federal League. That team folded the next year and the Cubs played their first home game at the park on April 20, 1916. The stadium held out for a long time with no lights, and the first night game was not played there until 1988! This stadium has also been remodeled for more seating and improved several times. 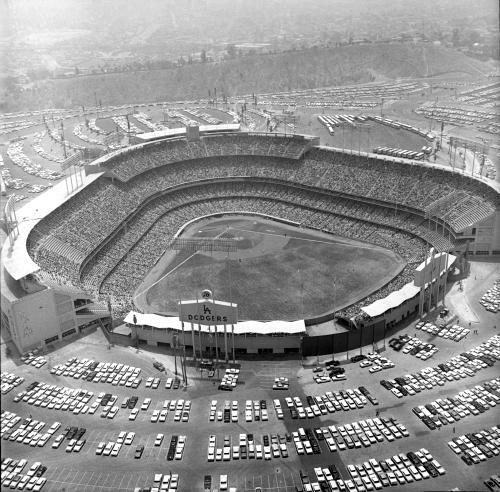 The only other stadium dating from at least 1962 is Dodger Stadium in Los Angeles, which was brand new that year. It is the largest Major League stadium by seat capacity. Though it was constructed completely with private funds, the City of Los Angeles provided the land at far less than market value, having used eminent domain to obtain some by condemnation for public housing that was never constructed. A public park was eliminated and an entire neighborhood was also forced out of the area. Between 1959 and 1962, eight-million cubic yards of earth and rock was moved. Palo Verde elementary school was even buried when the land was reconfigured and it sits beneath the parking lot northwest of third base. The stadium was originally designed to be expandable to 85,000 seats by adding to the upper decks over the outfield pavilions, but that expansion has never been constructed. The stadium was also designed to be earthquake-resistant and has withstood several serious California earthquakes. The Los Angeles Angels also played baseball in this park from 1962 to 1965, before moving to Anaheim. Some baseball highlights from 1962 included President Kennedy participating in opening day ceremonies at D.C. Stadium in Washington, DC, where the Washington Senators beat the Detroit Tigers 4-1 on April 9, 1962. If you’re interested, all the 1962 opening day lineups can be found at Baseball-Reference.com. Another highlight of the week occurred on April 13th, when the St. Louis Cardinals’ Stan Musial hit his 1,869th run, setting a new National League record. Other new records were also set this year. Los Angeles Dodgers’ shortstop Maury Wills stole 104 bases during the major league baseball season, breaking a record set by Ty Cobb 47 years ago. His efforts even included 2 steals of home plate! Many today credit Wills for reviving the stolen base as a baseball strategy. An odd record was for longest game played, set on June 24 between the Detroit Tigers and the New York Yankees. Their 22-inning game lasted seven hours, with the Yankees finally winning 9 to 7. This was also the first year for the National League to play a 162 game schedule; the American League had begun that schedule the previous year. Home run kings in 1962 were Harmon Killebrew, of the American League’s Minnesota Twins, with 48 home runs, and Willie Mays, of the National League’s San Francisco Giants, with 49. Leading Pitchers for the year were Hank Aguirre, of the American League’s Detroit Tigers, with an ERA of 2.21, and Sandy Koufax, of the National League’s Los Angeles Dodgers, with 2.54. Just like today, sports stars were celebrities. Because of the large New York City media market, New York Yankees players were often the biggest stars. As they had been doing for years, Yankees Mickey Mantle and Roger Maris cashed in well in 1962, with advertising endorsements and branded products. Mickey Mantle had been featured in advertising endorsements since the mid 1950s for products ranging from Wonder Bread, Cooper Tires, Kodak Film, Yoo-Hoo soft drink, Gem Razors, Post Cereals, and two different cigarette brands (Viceroy and Camel)! You could also read Mickey Mantle’s Baseball magazine, along with the more generic baseball magazines Dell Sports Baseball, Baseball Monthly, and Major League Baseball. Mickey was also featured on the cover of the March issue of Holiday Inn Magazine, as he owned one of the motels. Roger Maris also endorsed many products, including Aqua Velva shave conditioner, Camel Cigarettes, and Gold Mine Icicle frozen treats. His name was also licensed for two different baseball games introduced in 1962: Roger Maris Action Baseball by Pressman and Roger Maris Baseball Game by Play-Rite Games. The more generic Electric Baseball was also introduced by Tudor Sports Classics in 1962. 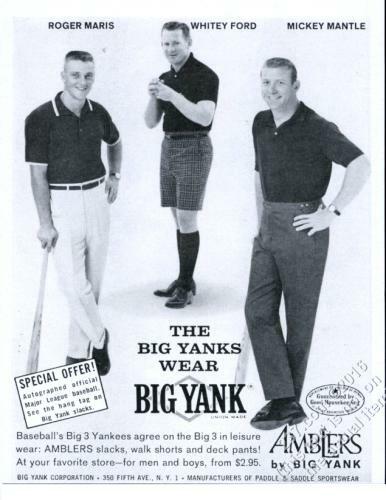 And Mickey and Roger teamed up with fellow Yankee Whitey Ford in advertising Big Yank slacks during 1962. As I write this, the World Series is only a month away, so let’s take a Roadtrip-'62 ™ look at the host cities for the 1962 series: New York, New York and San Francisco, California. The first two games were played at Candlestick Park, San Francisco, then the teams went to Yankee Stadium in New York for three games. They finished with the final two games back in San Francisco. Both cities had rain that delayed games, so the series took 13 days to play just 7 games. Neither team ever won two games in a row; they see-sawed the entire series. To get to the series, the San Francisco Giants had won their first National League pennant since moving out of New York in 1958. On the other hand, the New York Yankees had played in eight out of the ten World Series held in the 1950s, and started off the new decade looking like they would continue to dominate baseball, having played again in 1961. Future Hall of Fame members played for both teams and even one umpire, Al Barlick, was later elected to the Hall! Enjoy some highlights and I’ll see you here next week. Highlights of Game 7 of the 1962 World Series between the New York Yankees and the San Francisco Giants.